RAMALLAH (Ma’an) — Israeli troops used tear gas to suppress a march held by five Palestinian food production companies on Sunday near the Israeli Ofer prison in the occupied West Bank. The companies protested by parking their trucks near the prison, after Israeli authorities banned their products from entering Jerusalem and Israel. An Israeli army spokesman did not immediately respond for request for information about the protest. 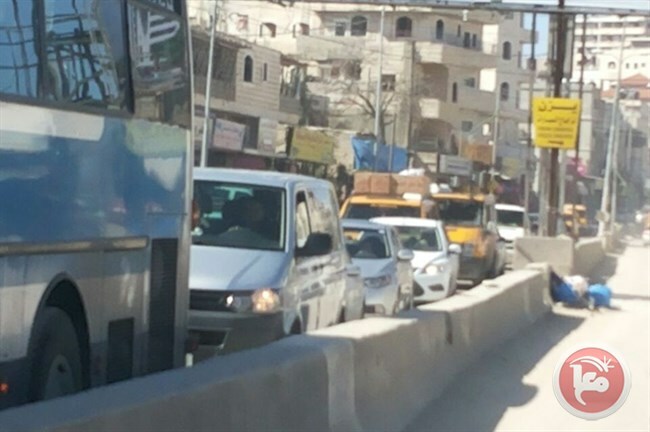 The director of marketing for the Hamoda company, Fadi Abu Hilweh, told Ma’an on Saturday evening that Israeli troops at the crossing have been turning back trucks of the five companies since Wednesday. Haddad added that the companies export their products to Jerusalem under agreements with Israel and that there was no grounds for the ban. He said the companies would continue protesting until Israeli authorities canceled the decision. Abu Hilweh said the companies were not officially notified of any decisions to ban their products in Israel and were “surprised” when Israeli soldiers at Beitunia commercial crossing denied their products entry to Israel on Wednesday. Hamoda has already notified its milk providers to halt supplies until the ban is resolved. Abu Hilweh said the five companies would have to discharge large numbers of workers if the ban continued. An official in the Palestinian Ministry of Economy, who requested anonymity, told Ma’an that the ministry was not notified of any such decision. “The ministry is looking into the case, which is a flagrant breach of Paris Protocols,” the official said, referring to an agreement signed in 1995 between the PLO and Israel, that set procedures and regulations governing economic relations between the occupied West Bank and Israel.